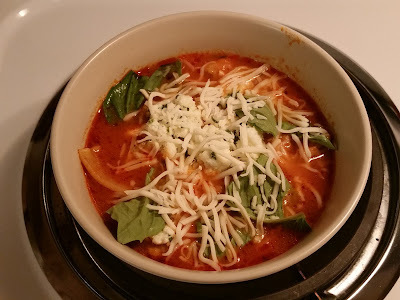 *I used a jar of marinara sauce, but skinnytaste has the link to Gina's marinara concoction, which I will use next time. 1. Heat large soup pot over medium-hi heat. Spray with oil and add sausage. Cook until browned, breaking up as it cooks. 2. Add onion and garlic. Cook 2-3 minutes. Add 2 tbsp. parsley, broth, water, marinara, bay leaves, pepper and bring to a boil. Cover and reduce heat and simmer 30 minutes. 3. In medium bowl combine ricotta, parmesan, and 2 tbsp. parsley and mix together. 4. Add broken pasta to soup pot and cook uncovered until noodles are tender. 5. Divide into 6 bowls and top with 2 tbsp. ricotta mixture and 2 tbsp. mozzarella. -I felt the parsley was a little overwhelming for me, so I think next time I will use less than the recipe calls for. - I removed the bay leaves from the soup. I know it doesn't say to, but I wouldn't leave them and eat them. I'm not a soup person, but I admit this one looks reallly good! Really? I love me some soup! Especially in the wintertime! Haha. I'm really not a soup person, but this one sounds really nice for the cold months!